As an option to environmentally conscious consumers and companies, we also offer a variety of EPA and CARB compliant systems. The entire line of AaLadin products is manufactured in the U.S.A. according to strict quality control standards using only the finest materials and components. All products are covered by full manufacturer’s warranty. We also have detail and cleaning supplies to complement your pressure washer and steam cleaning needs. 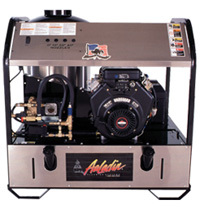 Plus, we service all makes and models of pressure washers. 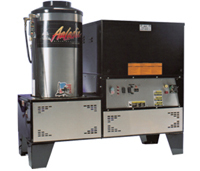 Our electric and stationary pressure washers are revolutionary hot water washers equipped with heavy-duty, removable high pressure heating elements which heat water instantly. Plus, our exclusive system protection devices monitor water flow, water pressure, and water temperature to keep your washer running strong. These powerful washers are capable of producing pressure from 1200 to 3000 PSI and water flow from 2 to 12 gpm. These are ideal for those situations when open flames or exhaust cannot infiltrate the cleaning area. These units' innovative design include state-of-the-art controls and safety features as well as a heating chamber constructed with removable elements for easy access. This product line is a great choice for jobs that require steam or high pressure at a reasonable cost because they are economically priced and loaded with several standard features. With an Exclusive Combustion Chamber Insulation System, pressure ratings from 300 PSI to 3,000 PSI, and Flow Output from 2 GPM to 5 GPM. This Series has little competition in it's price range. 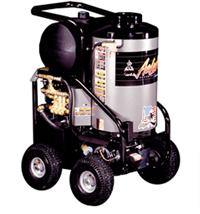 Our Self-Contained Pressure Washers offer a range of 3 GPM to 12 GPM, and 2000 PSI to 4000 PSI is offered. None of these models require external electricity to be operated, and each unit is built with heavy-duty components to withstand rough transportation conditions. These self-contained units can be mounted on trailers or set inside vehicles, placed in the back of trucks or pick ups, or used on the decks of ships and cabins of airplanes. Every unit in the 40 series is powder coated, contains Beckett Burners, and comes with gasoline & LP engines rated at 9 HP to 24 HP, or diesel engines rated from 10 HP to 32.7 HP.